Mydoom is reported to be the most damaging virus or worm ever released, followed closely by Sobig. It also set records for spreading ability. Mydoom can be transmitted through email or file sharing with Kazaa. To be transmitted through Kazaa, the user must download the worm from an infected computer on the Kazaa network. The .zip version will be an actual .zip file with a copy of the worm bearing the same name as the .zip. If it has an .exe or .scr extension, the attachment will have an icon similar to that of a .txt file in Windows XP. 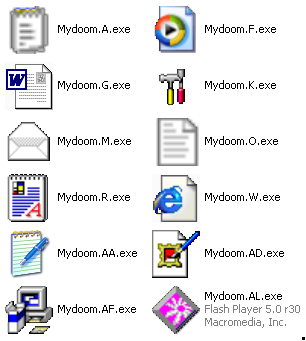 When Mydoom is executed, it copies itself to the Windows system folder as Taskmon.exe (which is a legitimate file, though only when found in the Windows folder). It also creates the file Shimgapi.dll in the system folder. This file is a backdoor trojan that opens TCP listening ports ranging from 3127 to 3198 and can download and execute arbitrary files. A file named Message, which contains random letters when opened with Notepad is placed in the Temp folder and opened in Notepad. The worm creates or modifies several registry keys. It adds the value "TaskMon = \System Folder\taskmon.exe to two keys, one a Local Machine and the other a Current User registry key, both ensure that the worm will run every time the computer is started. It cradds the value "(Default) = \(System Folder)\shimgapi.dll" to a root registry key that ensures shimgapi.dll will be run by Internet Explorer when the web browser is run. It also creates a Local Machine and current user version of another registry key. Between 2004.02.01 and 2004.02.12 the worm tries to perform a [[Denial of Service|DoS attack]] on the website www.sco.com. It creates 64 threads, which make an HTTP GET request from a random port on the infected computer to port 80 of www.sco.com. There is a 25% likelihood that the attack will come from any given infected machine because of the way Mydoom verifies the date. Mydoom produced several variants of note. Mydoom.B launches a Denial of Service attack against both SCO and Microsoft. It begins its attack on www.sco.com on February 01, using 7 threads to constantly send a GET request to the website. It begins its attack on www.microsoft.com on February 03 and uses 13 threads. Email monitoring service MessageLabs blocked 7.4 million copies of Mydoom.A. Mydoom.A had infected about one out of every 41 email messages. It was even at one point in one in every twelve emails, breaking Sobig's record of one in every 21. It accounted for 20-30% of worldwide email traffic shortly after its release to the wild. Major websites moved temporarily or permanently to new addresses to avoid the DoS attack. F-Secure antivirus expert Mikko Hypponen called Mydoom the "the worst e-mail worm incident in virus history". MessageLabs ranked it number 5 on its list of most active worms. It caused slowdowns of internet traffic worldwide. Kaspersky estimated that 600,000 to 700,000 computers were infected with the worm. Thirteen percent were in the US, while one percent were in its home country of Russia. The comparative lack of infections in Russia was attributed to better security practices in Russia. SCO moved its website www.sco.com to www.thescogroup.com in response to the amount of requests sent to the site. The group offered a $250,000 reward for information leading to the capture and conviction of the creator of the Mydoom.A worm. Microsoft offered a similar reward for the creator of the Mydoom.B worm, which attacked their site. Mydoom and its variants are said to have caused $38.5 billion in damage. This number however comes from the Mi2g organisation, which is known for its extremely, often absurdly, high damage estimates. The SCO Group, which owns the rights to Unix, sued several vendors and supporters of Linux, claiming that some of its proprietary code was used in the system. The company sued Novell (former owners of SuSE, now a part of Attachmate), AutoZone and Daimler-Chrysler and was sued by Red Hat and IBM. This action caused much anger in the open source community, causing many to suspect they were involved. Many open source groups around the world denied this and condemned the creation of viruses and worms. Mydoom's origin was traced to Russia when Kaspersky Labs location-sensing software followed the original emails to ISPs from Russia. A famous British IDM musician called Aphex Twin released a song named W32.Mydoom.AU@mm on his 11th Analord EP. He has released several songs about viruses and other malware, including Redolf and Ranky on the same album. Other tracks involving viruses in the album include Analord 8 and Analord 9.